* As a recent returnee to the City By The Lee - I've found a lot of changes - most for the positive on the pub (and food) scene - and lots of new, local craft breweries reviving Cork's ancient tradition of being a brewing, mercantile port, which exported it's beers & ales to the four corners of the world. But where to go when you are looking for a pint? 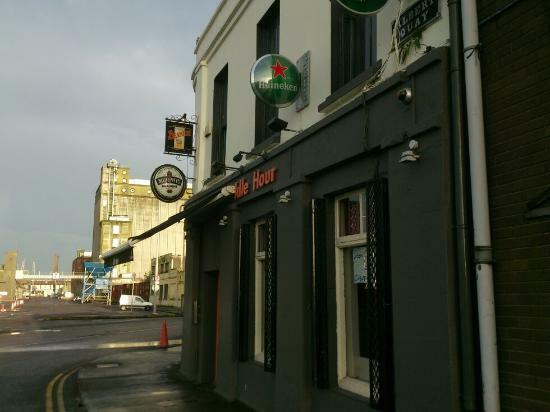 Well, there are plenty of "Ten Best Pubs In Cork!" lists on various websites - they're all useless, like. Seriously - this is the only list you need - accept no other list of the Best Pubs in Cork. Pour scorn on them. Shun them in the street, your workplace and your place of worship. For they know not what of they talk about. Here - in descending but not too particular order - are the Ten Best Pubs in Cork - accept no feckin' substitutes. I have avoided the obvious - and stayed off the main drags. 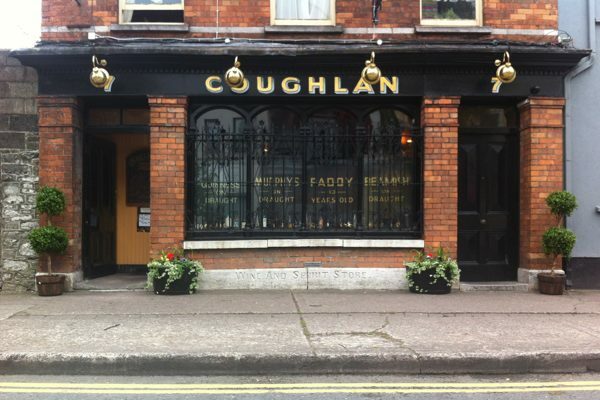 There are plenty more great bars and pubs around Cork - but most of these do not appear on other lists and I believe they deserve a wider audience. Push through the slightly wonky door of The Castle on South Main street and say hello to 1952. Seriously. You can talk of "Time Warp" pubs, but it's rare to pass through an actual dimensional portal to the Pinting Past. The Castle - with it's blinding fluorescent strip lighting, scuffed floors, walls, ceilings and serving staff - plus advertising posters that somebody forgot to take down in 1962 - is not TRYING to be cool old school, it just found the right decade and decided to stay in it. There's often an open fire going, there's a snug that people go into and never appear to come out of and it gives you the feeling that you could locate yourself in here and survive a nuclear winter. Or a bad break up. Reassuringly, unapologetically scruffy. The Proustian scent of ancient Beamish, yellowing fly-paper and Christy Ring's Brylcream. Lovely. Pros - Real Old School - no fakery. Cons - The fluorescent strip lighting. Like you are about to be interrogated by the Stasi. Most likely to Meet - A man in a tweed jacket - perusing the racing pages. 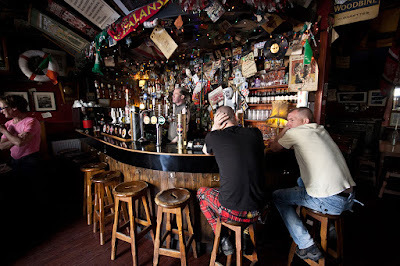 Once a sailors & dockers pub, on the quays down where the city ends and ships still dock, The Idle Hour is a very traditional, plank-panelled Cork boozer that can get pretty lively at the Weekends but is perhaps best enjoyed when you have an actual idle hour of a lazy afternoon. A welcoming sanctuary, sitting on the quay, looking out over the docks. Pros - Location - on the Waterfront. Cons - Not a lot - can get very loud at the weekends but throw yerself in. Most Likely to Meet - God knows - a curious shop. You can't compile a list of Cork pubs and leave out Tom Barry's Of Barracka. The joy here is the mix of a cosy, plank-panelled pub with a fine beer-garden out the back. 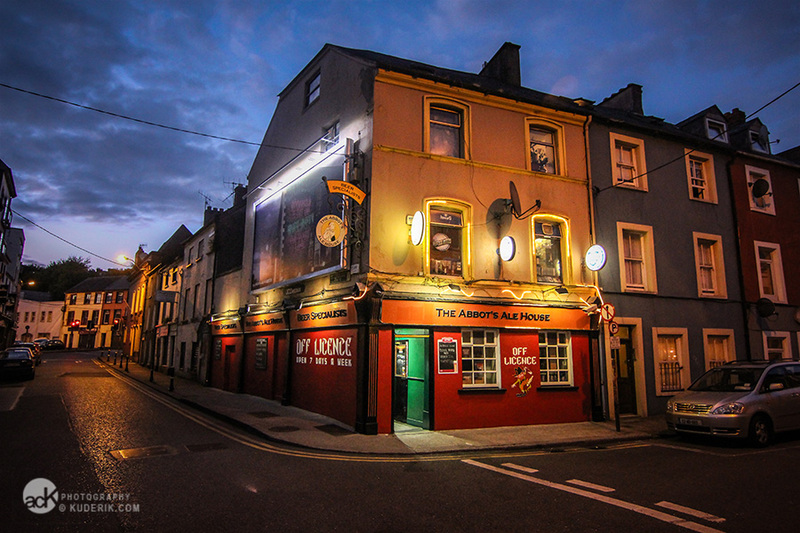 Tom's sits close by the walls of a city centre, 17th century Star-Fort, on one of the oldest streets in the town. They also do fab pizzas from their own brick oven in the garden. During the day, they leave out copies of the Irish Times crossword. At night, it gets pretty lively with lots of students. Pros - Gorgeous cosy interior, cool garden. Cons - Not a lot - pretty close to perfect. Most Likely To Meet - Students. Locals. Sound heads. A real hidden gem. A warm, welcoming pub, in the shadow of the soot-black gothic fantasy of St Finbarr's Cathedral. The Abbey is a little off the beaten track but well worth finding. Nice little smoking area and a great wine-list too. Pros - A little quirky with lots of dark comfy corners & banquettes. Cons - Not exactly a buzzing neighbourhood - but that's part of the charm. Most Likely To Meet - Student or professor from nearby UCC. 6 Abbot's Ale House - Devonshire Street - Northside, Like. 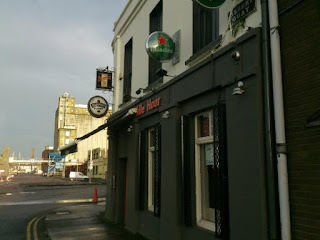 Big changes here recently - the pub has moved downstairs - and what you will find is one of the best - if not the best - hard-core craft beer pubs in Cork or indeed Ireland (also great small batch whiskeys). 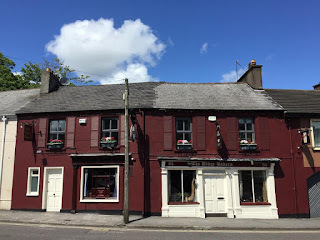 The barman is very friendly & really knows his stuff - you can have a little sample of some very quirky beers and on many nights, there'll be a couple of guys playing music in the corner - a little gem. 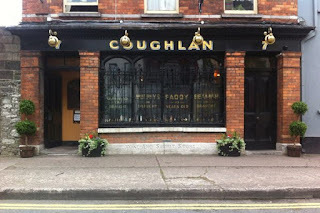 This place is pure Cork - quirky, unexpected, not obvious - requiring you to take a little chance. Pros - Probably the best selection of craft beers in Cork. Cons - Not many - a little on the claustrophobic side. Most Likely to Meet - Craft beer fiends. Yes! It's a cocktail bar. And a little bling-y. But if you are looking for authentically good cocktails in a gorgeous setting, this converted Victorian wine-vaults on McCurtain Street is a little special. Hey, if I just gave yiz ten auld lad/craft beer bars I'd be letting ye down. Cork doesn't really do bling - the aesthetic/vibe is more shabby than chic - but Cask is a recent and very welcome addition to the scene, adding something that had been lacking in the city. Very busy/Party vibe at the weekends. But not what you might expect. A lot of thought has gone into this gaff. Pros - Gorgeous spaces - great cocktails. Cons - If you were snobby, you might accuse Cask of being try-hard. But it's really not. Most Likely To Meet - Dolled up Old Dolls, Lads who look like they've lifted a weight or two. Everybody will tell you - St Lukes is the gentrified, hipster heart of Cork - which means they have ....a bakery. But it is a lovely part of the city, climbing up the steep hill towards the Victorian terraces of Montenotte. And Henchys is a lively, cosy, welcoming shop. 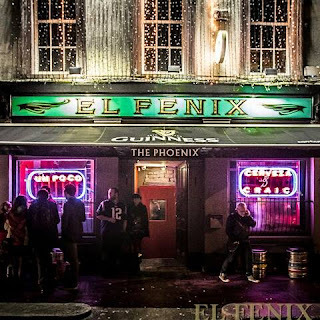 Lots of live music, a great crowd of locals and a very traditional Cork pub vibe. You can walk up here from McCurtain Street in ten or 15 minutes. Well worth it. Pros - Lots of little snugs, nooks and crannies - a great place to get lost for an afternoon. Cons - Can get loud at the weekend. That's about it. Most Likely To Meet - The odd eejit back from Sydney or Silicon Valley, banging on about the Victorian Terraced house he's renovating for buttons. But mostly locals. Right on the river in the city centre - a great shop altogether, very Cork, tiny, quirky, friendly, great live music on a regular basis and just a fab place to lose a few hours in. A session pub. Cons - Cork folks will tell you it's a bit of a trek from Patrick Street - we are not a people who like to walk much. Or at all. Most Likely To Meet - Old Punks, Indie-Heads, Rude-Boys, Crusty-Types, Struggling Musicians. 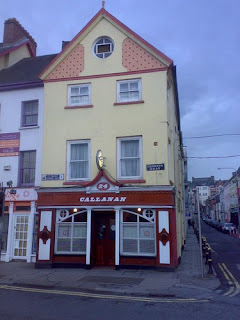 Pronounced "Call-ans" - A real survivor, Victorian bar that has been given a new lease of life as one of the best small music venues (or the best judging by its many awards) in Ireland. By day, a great old pub with wrap-around beer-gardens, by night, lively music venue. Again, a little hidden away - but well worth finding, especially if you love your live music. Pros - Many & Varied. Most Likely To Meet - Anybody, really. 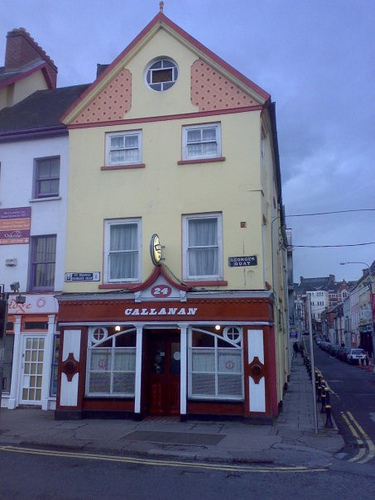 1 Callanans - George's Quay. If I had to pick one pub to represent the best traditions of Leeside hostelries, it would be the quintessentially Cork-esque Callanans. It don't look like much from the outside. It don't look like much from the inside. There's no real indication that it's changed an inch since 1966. But this is Cork. A plank-panelled, lino-floored pub, with simple bench seating, a tiny little snug, a friendly and welcoming family-owned vibe and always somebody to have a chat with. It's the kind of place the creatives behind a beer ad would spend big money trying to fake and yet not get even close. Right on the river, next to a bridge in the heart of the oldest part of Cork. Opens at 7.30 every night, cheapest and best pint of Beamish stout in town and an extensive food menu that runs all the way from Salted to Dry Roasted peanuts. Cons - Only opens at 7.30pm but they do say hunger is the best sauce. Most Likely To Meet - Literally anybody. This list gets my stamp of approval anyway. I'd include Dan Lowry's on McCurtain Street, Fionnbarras on Douglas Street and the Fran Well on North Mall too if I could. Terence is name of the barman in Abbott's too, just fyi. Dan lowreys bar. Fabulous little place. Long valley and Dan lowreys should have been there. Bierhaus surely? 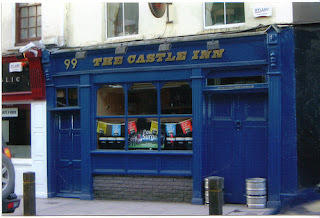 Castle inn? Hib? Cornerhouse? Why has nobody said sin é? Come on now lads. Given the amount of pubs in Cork, you could probably do a 'list of the best' for different areas and still miss a few. Not a bad idea though Joe ? Sin e"dan lowreys. Corner house. I'm curious to know which one Rory Gallagher might have frequented when he wanted to put down his guitar for a bit and enjoy a quiet pint?